The Landing Craft Air Cushion (LCAC) is a class of air-cushion vehicle (hovercraft) used as landing craft by the United States Navy's Assault Craft Units and the Japan Maritime Self-Defense Force (JMSDF). They transport weapons systems, equipment, cargo and personnel of the assault elements of the Marine Air/Ground Task Force both from ship to shore and across the beach. two 12.7 mm machine guns. Gun mounts will support: M2HB .50 cal machine gun; Mk 19 Mod 3 40 mm grenade launcher; M60 machine gun. Tests conducted with GAU-13 30mm gatling gun. The LCAC first deployed in 1987 aboard USS Germantown (LSD-42). LCACs are transported in and operate from all the U.S. Navy's amphibious-well deck ships including LHA, LHD, LSD and LPD. 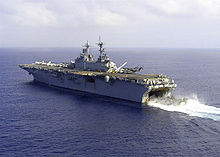 Ships capable of carrying the LCAC include the Wasp (3), Tarawa (1),Anchorage (4), Austin (1), Whidbey Island (4-5), Harper's Ferry (2), and San Antonio (2) classes. All of the planned 91 craft have been delivered to the Navy. Of these 91 LCACs, seven of these have been disassembled for FGE, ten are in deep Reduced Operation Status (ROS), two are held for R&D, and 36 are in use on each coast at Little Creek, Virginia and Camp Pendleton, California. Eight minesweeping kits were acquired in 1994-1995. The craft operates with a crew of five. In addition to beach landing, LCAC provides personnel transport, evacuation support, lane breaching, mine countermeasure operations, and Marine and Special Warfare equipment delivery. The four main engines are all used for lift and all used for main propulsion. The craft can continue to operate, at reduced capabilty, with two engines inoperable. They are interchangeable for redundancy. A transport model can seat 180 fully equipped troops. Cargo capacity is 1,809 sq ft (168.1 m2). The LCAC is capable of carrying a 60 ton payload (up to 75 tons in an overload condition), including one M-1 Abrams tank, at speeds over 40 knots. Fuel capacity is 5000 gallons. The LCAC uses an average of 1000 gallons per hour. Maneuvering considerations include requiring 500 yards or more to stop and 2000 yards or more turning radius. The bow ramp is 28.8 ft (8.8 m) wide while the stern ramp is 15 ft (4.6 m) wide. Noise and dust levels are high with this craft. If disabled the craft is difficult to tow. In recent years spray suppression has been added to the craft's skirt to reduce interference with driver's vision. The LCAC is a dramatic innovation in modern amphibious warfare technology. It provides the capability to launch amphibious assaults from points over the horizon (OTH) from up to 50 miles offshore, thereby decreasing risk to ships and personnel and generating greater uncertainty in the enemy's mind as to the location and timing of an assault, thereby maximizing its prospects of success. The LCAC propulsion system makes it less susceptible to mines than other assault craft or vehicles. Due to its tremendous over-the-beach capability, the LCAC is accessible to more than 80% of the world's coastlines. Previously, landing craft had a top speed of approximately eight knots and could cross only 17% of the world's beach area. Assaults were made from one to two miles off-shore.Its high speed complements a joint assault with helicopters, so personnel and equipment can be unloaded beyond the beach in secure landing areas. For 20 years, helicopters have provided the partial capability to launch OTH amphibious assaults. Now, with LCAC, landing craft complement helos in speed, tactical surprise and without exposing ships to enemy fire. The similarities between a Navy LCAC and an airplane are substantial. The craftmaster sits in a "cockpit" or command module with a headset radio on. He talks to air traffic control which for LCAC's is well-deck control located near a ship's sterngate. The ride feels like a plane in high turbulence. The craftmaster steers with a yoke, his feet are on rudder controls -- and he flies a lot like a hockey puck on an air hockey table, The LCAC is similar to a helicopter in that it has six dimensions of motion. Operating the LCAC demands unique perceptual and psychomotor skills. In addition, with a machine as expensive and inherently dangerous as the LCAC, sound judgment and decision-making also play an important role. Concerns over escalating training cost, projections for an increased number of LCAC vehicles and crew, and a high attrition rate in training highlighted the importance of developing a more accurate means of selecting candidates. Attrition of operators and engineers has dropped from an initial high of 40% in 1988 to approximately 10-15% today. In Fiscal Year 2000 the Navy started an LCAC Service Life Extension Program (SLEP) to add 10 years of design life to each craft. The SLEP will be applied to 72 LCACs, extending their service life from 20 to 30 years, delaying the need to replace these versatile craft. US Marines loading onto a LCAC within the well deck of USS Wasp (LHD-1), 2004. Armament: two 12.7 mm machine guns. Gun mounts can support the M2HB .50 cal machine gun, Mk 19 Mod 3 40 mm grenade launcher, or the M60 machine gun. Tests conducted with GAU-13 30mm gatling gun.